Sean McComb, Lewis Crocker and Steven Donnelly will all feature at the #MTKFightNight at Ulster Hall on May 17. 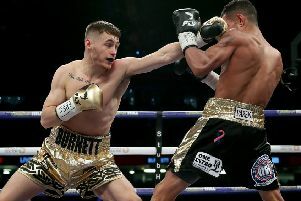 The bill is topped by the return of former unified world champion Ryan Burnett in a WBC International super-bantamweight title clash with Jelbirt Gomera – with the IBF European title clash between Belfast’s Marco McCullough and Declan Geraghty providing chief support. In addition McCombwill look to go to 7-0 while another of the city’s emerging forces Lewis Crocker (7-0, 6 KOs) ends eight months out of the ring. Olympian Donnelly fights for the first time since impressing Madison Square Garden on his American debut back in October and – along with McComb and Crocker – will be part of the ESPN+ broadcast in the US as well as the iFL TV live-stream. 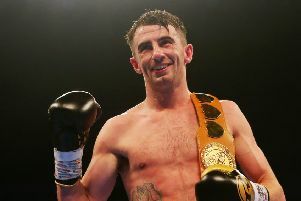 MTK Global Professional Development Coordinator Jamie Conlan said: “This bill is approaching a who’s who of Belfast boxing talent and there is so much emerging talent on this undercard. “As well as two mouth-watering title fights, fans now have the chance to cast their eyes over some of the title challengers of tomorrow and it’s great to keep building connections between fighters and their local supporters.